The KRR group I am visiting has created a “coffee reserve bank” for managing the use of the Illy coffee pods and the non-Illy espresso machine. Despite efforts, they did not manage to source a true Illy espresso machine in South Africa. Does it make a difference? You might think it does not—compared to the alternative of soluble coffee granules, the difference is indeed negligible—but one should not underestimate the complexities of the whole endeavour of making a good espresso. For instance, as the late Mr. Ernesto Illy has shown, the perfect timing for an espresso is 30 seconds. Not longer, not shorter. 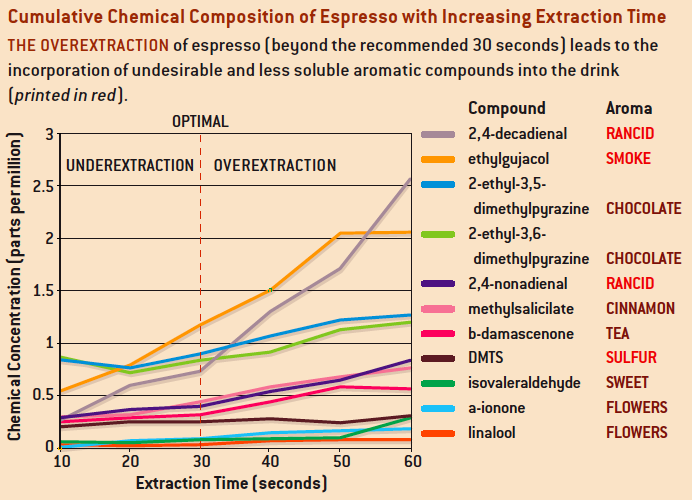 The cumulative chemical composition of espresso with increasing extraction time (Source: 1). What else is essential for the perfect espresso? First, there are the plants with their genetic composition (Coffea Arabica is the best) and the growth conditions. The latter includes the soil composition, altitude, amount of rainfall, sunlight, and temperature fluctuations. Third, there is the roasting process. The green bean that enters the roasting process has about 250 volatile molecule types, which is bumped up to over 800 during the roasting process. At a temperature of 185-240 degrees Celcius, the well-known Maillard reaction takes place between amino acids and sugars (the same reaction is responsible for the brown bread crust). Depending on the temperature of the roasting, it should be done for a longer (up to 40 minutes) or shorter (90 seconds) period of time, thereby affecting the final result (different times and temperatures cause different chemical reactions to take place). The aromas that are generated during this process are analysed by gas chromatography and with olfactometry, and subsequently mass spectrometry is used to identify the chemical. According to the New York Times obituary on Ernesto Illy, there are 114 quality-control checks between the arrival of the raw beans at the start of the food processing and shipping the roasted beans. That much for the coffee bean itself, and onto brewing the coffee. The extraction of the components from the ground coffee is done by heated water. Not discussed explicitly in the SciAm paper, but using plain physics and chemistry: what is extracted depends on the size of the granules (so that there is more or less surface to come into contact with the water), the temperature of the water, the pressure applied when the water percolates through the granules, and how long the water is in contact with the granules. The longer the two are in contact, the more gets extracted. In casu (continuing with information from ), with filter coffee, the contact is 4-6 minutes, which causes relatively large quantities of acids and caffeine to dissolve; go figure the extraction with the French press/cafetiere method, which is also associated with elevated levels of cholesterol (sci and popsci article). During the 30 seconds percolation for espresso, less acid and only about 60-70% of the caffeine is dissolved into the liquid. (So, a “long espresso” gives you more caffeine.). As a side note, the water temperature for espresso is 92-94 degrees, the pressure goes up to 9 atmospheres, and when the hydraulic resistance of the coffee ground bed (the pod or loose coffee) is slightly less than the pressure of the water, the water flows through at a rate of 1 mm per second, producing about 30 ml espresso coffee in 30 seconds. If the color of the foam topping is light, it means that the espresso has been underextracted, probably because the grind was too coarse, the water temperature too low or the time too short. If the crema is very dark in hue and has a “hole” in the middle, it is likely that the consistency of the coffee grounds was too fine or the quantity of grounds was too large. An overextracted espresso exhibits either a white froth with large bubbles if the water was too hot or just a white spot in the center of the cup if the brewing time was too long. If you want to know more about it: read the paper, check out the Association for the Science and Information on Coffee that organises scientific conferences on coffee (chemistry, genetics, processing etc etc) and gathers other scientific articles published elsewhere, and experiment yourself :). Ernesto Illy. The complexity of coffee. Scientific American, June 2002, 86-92. This entry was posted in Science general and tagged coffee, espresso, Illy. Bookmark the permalink. Seriously, 30seconds. Regardless of grind size, age of beans, style of roast, dose, humidity, temperature of the water, ambient temperature. I wouldn’t want to argue with such an esteemed man, but seriously? I think baristas need more respect than that.